Human cell culture, cryptographic cults and Scottish schoolgirls. Mental maps, formal outlines and free writing. Getting ideas out of my head and onto paper is always challenging and I’ve found that different techniques work on different days. Segments, rays and angles. One of the few things I remember about my high school coursework is doing proofs in geometry class. I loved them. Weird, I know. I guess my brain just likes logic and structure. 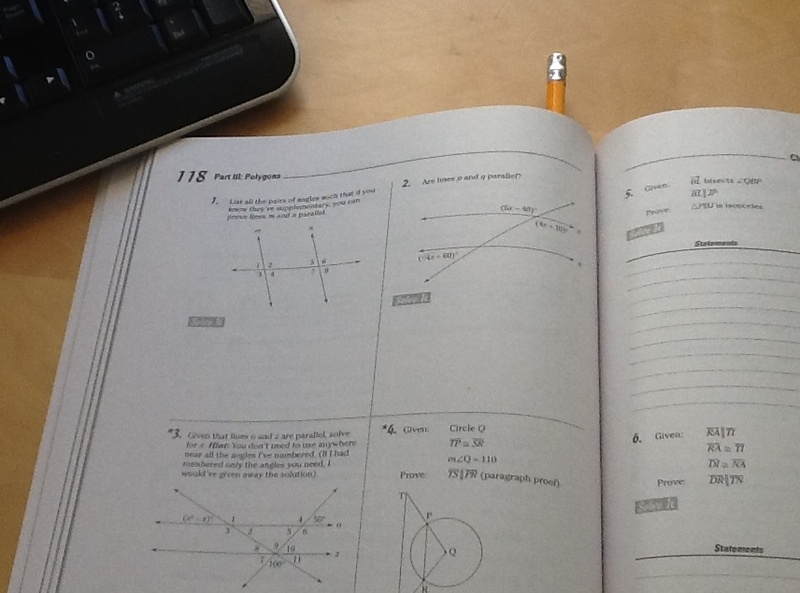 So, fully embracing my inner nerd, I purchased a geometry proof workbook. And I’ve found working through it to be strangely meditative. Who knew? And speaking of school, do you remember your Trapper Keeper? I love this article on the market research behind the product. This entry was posted in Reading and Writing and tagged Geometry, Management, Reading, thinking, Trapper Keeper, writing on October 4, 2013 by Bernadine.